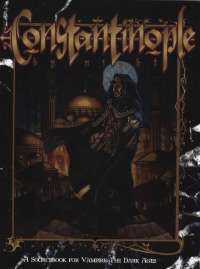 Greatest city of the medieval world, domed Constantinople is a lodestone for the vampires of the Dark Ages. Immerse yourself in intrigues ancient and contemporary as you traverse the labyrinthine streets and torchlit bazaars of Byzantium's wondrous capital. This is the first setting book for Vampire: The Dark Ages. This title was added to our catalog on September 17, 2007.